The Chapal Cup being contested between Pakistan and Australia in the UAE kicks off tomorrow at the newly built Dubai Sports City Cricket Stadium. Who do you think will be the leading run scorer in the series? Who do you think will be the highest wicket taker? If you can answer those correctly, you will be eligible for a free gift voucher from the Gulf Cricket Academy. The Gulf Cricket Academy is based in Sharjah and trains young and aspiring cricketers with the hope to get them into the UAE cricket team in the future. 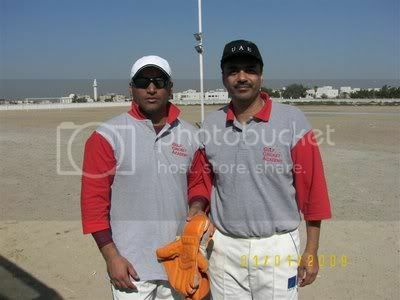 The Academy is run by Muhammad Afzal and Sohail Javed, both of whom are professional cricketers. While Muhammad Afzal has played first class cricket in Pakistan and Division A and B cricket in the UAE, Sohail Javed has played Division A and B in the UAE and has been coached by the former Pakistan tweaker, Tauseef Ahmed. As for the free gift vouchers, you just have to predict the highest run scorer and highest wicket taker of the Chapal Cup, and leave your responses in the comments section below before the start of the 3rd ODI of the series on 27th April. The person who predicts the questions correctly will receive a gift voucher worth AED 50 from the Gulf Cricket Academy that can be redeemed at AJ Sports, a leading distributor of cricket equipment in the UAE. Thats is AED 50 for each question - so a total of AED 100 to be won. If there is more than one correct answer then the winner will be determined through a draw. So send your answers in. Leading wicket taker will be Shahid Afridi. The Leading run scorer will be MICHEAL CLARKE. The Leading run scorer will be JAMES HOPES. Leading wicket taker will be NATHAN HAURITZ. The Leading run scorer will be ANDREW SYMONDS. The Leading run scorer will be Shane Watson. BOWLER - S. AFRIDI - " "
No more entries after this.